I decided to write up this blog post because a lot of you have emailed/commented/tweeted me asking how my bookstagram process works and what are the “right” ways to bookstagram. There is no “right” way; there is “your” way and that is the only way. So this post is going to be a “How Natasha bookstagrams,” and maybe you can take some pointers (I’m using this term lightly because I don’t consider myself to be a pro of any kind) and make them your own! First and foremost: Quality over quantity, every single time!!! I love taking quality pictures, meaning they serve a purpose & tell a story. I’m not a fan of posting just to post. When I do post, I make sure that the picture isn’t blurry, has a solid angle and has good – no, great—lighting. Lighting is seriously everything when it comes to taking photos. If your lighting is off, the quality of your picture will definitely be off, so keep your lighting in mind! 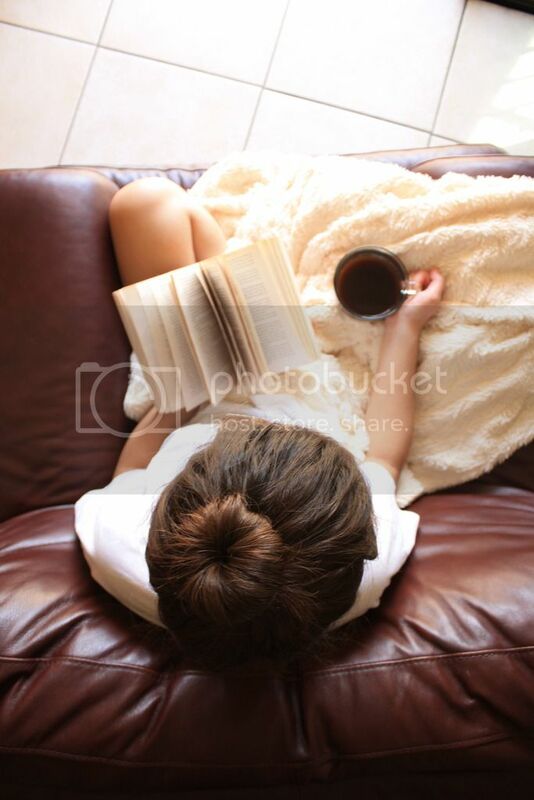 Next up: take pictures that you love and of books that you love. Your bookstagram is your own space where you can share your favorite reads, recommend them to the world and have discussions with your fellow insta-friends!! Once you've got that perfect picture, don't be afraid to filter it! I use VSCOcam to filter my photos because they've got tons of amazing filters that aren't too harsh and just feel more authentic. Hashtag. HASHTAG. H-a-s-h-t-a-g!!! Don't be afraid to go hashtag crazy -- you want other people to see your photos! Just try and stick to hashtags that relate to your post. Also, be an active member in the bookstagram community! 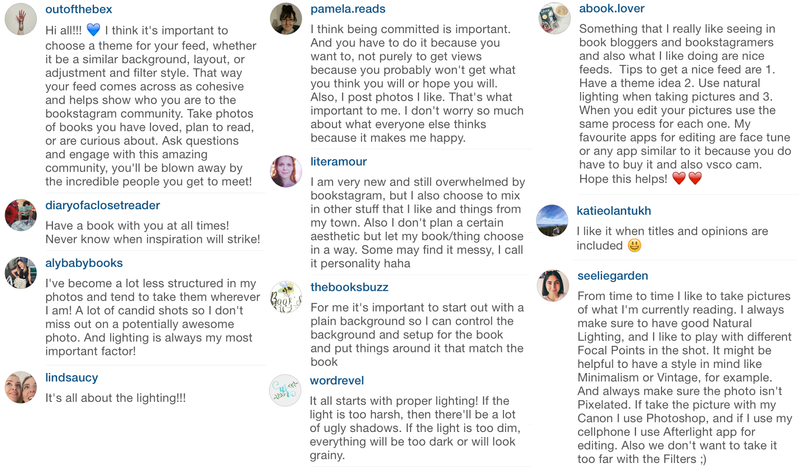 Follow/comment/like other bookstagrammer's posts; make yourself a known participant on bookstagram! I love taking pictures wherever I go (you better believe I carry around a book or two, all the time) because having that change in scenery can seriously make my feed that much more vibrant and different. This doesn’t mean you have to start lugging around a backpack filled with books just in case; it means that when a photo opportunity happens to present itself, go for it! Seriously, you don’t want to travel with me because I am always on the lookout for a fab picture to take and almost always annoy my friends & family with this whole “bookstagram thing.” It’s taking over my life (not that I mind). I hope this post has been helpful! 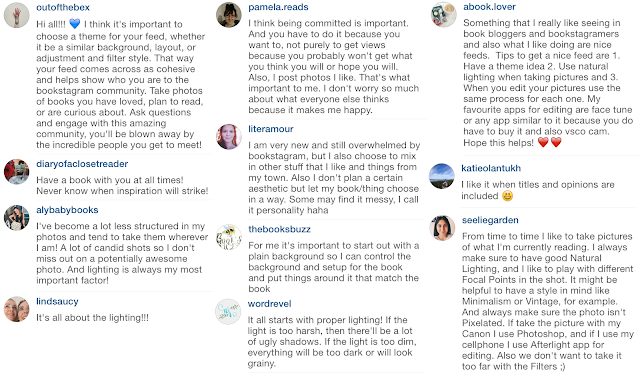 Remember: make your bookstagram a reflection of your personality. It's meant to be a creative outlet, so create what you want and post what you love! Find me on bookstagram here! OMG This post is golden and thanks so much. I'm going to change my feed soon so I hope to use all these wonderful tips in helping me. So glad you're blog is up and running because now I could totally read some awesome posts. Also thanks for including my tips!